It was 1992. The wall had fallen only a few years before. Communism was virtually dead. We had enjoyed a quick and easy victory in Iraq (GW1, at least seemed easy). Long live the free market, democracy and the USA. That was when arguably the best set of talent in one sport had ever been assembled to play together for the Olympic Games in Barcelona. Who knew that would end up being my future home city. The names were legendary and the talent was spectacular. Team USA basketball went onto to win the gold medal, going 9-0, with an avg. margin of victory of 43.8 points (thank you Wikipedia), and never used a timeout. That is pure dominance. For the next 8 years, Team USA continued to win, but every year the margin of victory was smaller and the effort required was greater. Finally, in 2002 Team USA finished 6th the World Championships in Indiana. Team USA lacked discipline and did not prepare for the future. We were lazy and sloppy. There were virtually no team practices and assembling a team was a joke. Basically, we just scrapped together what players we could get to play (with permission from the companies who paid their endorsement contracts as well). Meanwhile, all other countries maintained a permanent team roster, scheduled practices, exhibition matches and participation in other tournaments. Team USA was in denial for the next 4 years. It could not put together a solid team, which understood how to play as a team, and floundered in the 2004 Olympics. Finally, in 2006, the NBA realized that it had to get smart and serious in its cooperation with Team USA. They would have a permanent coach and players would have to commit to play for 3 years on the team. Invitations were given and tryouts conducted in Las Vegas. While they still failed at the 2006 Championships to get a gold medal, it was early in the process. All eyes are focused on the Beijing Olympics. a willingness to not cut corners. OK, but why is the title of this post "USA Basketball as a microcosm of the USA today"? The USA is like Team USA Basketball around 2002. My country has been lazy, arrogant, and has not made the right investments while the rest of the world has been raising its level of competition and competence. The election this year is basically between those who still see the USA as the Dream Team (McCain) and those who recognize that while we used to be the Dream Team, we lost our step along the way (Obama). Much of the country is still in denial about the rise of China and India and a mature EU as true economic competitors across the board. A lot of the focus on patriotism in this election, is really a reflection by one side that they are unable to admit that the USA needs to get its act together. They are sticking to their belief in American Exceptionalism even though everyday the USA without improvement is just a little less exceptional. This exceptionalism came from continued investment in people, infrastructure, and ideas. Unfortunately, the lack of smart investment in infrastructure and people made beginning in the 80s through to today reflects itself in a crumbling K-12 educational system, collapsing bridges and levees, and faltering mortgage market (A lot less people who are now foreclosed on, would have bought the house in the first place if they had had a reasonable economics education). It is time for the USA to recognize that it needs to compete not on talent alone, nor intimidation, but simply by being better than everyone else. That will not happen until we rebuild our education system, provide healthcare, build infrastructure intelligently, and approach the world with the understanding that "you know, they've got game too". Google seems to have updated their security in Google Analytics for exporting data, so I updated the Google Analytics to Google Docs Greasemonkey Script to accomodate the GA improvements. 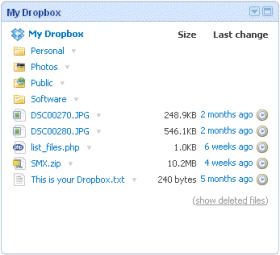 Update 01/12/2009: Dropbox changed their primary domain and iGoogle does not handle the redirect correctly, nor have I found a way to update the link via iGoogle. Here are the new links to add a new module that works. Sorry for the delay. Update: I have made a greasemonkey script to optimize the Dropgadget Gadget UI for Gmail as well as improve the iGoogle interface. UPDATE #2: I have just released v2 of the dropbox gadget. I have changed the gadget type to URL instead of HTML and I am hosting the gadget files directly using Dropbox. This allows the gadget to test if 3rd Party Cookies have been allowed for the getdropbox.com domain. It seems that Dropbox has updated their privacy settings on their site so that IE now will let users access the gadget using the default privacy settings. In Firefox, however, if you have deselected "Accept 3rd Party cookies" you need to add getdropbox.com to the exceptions list. Thanks for all of your support and the for the mention from Lifehacker. The new iGoogle gadget. * API does not appear to be available for all users and browsers just yet. I switched back to the legacy API for all of the code. The cookies set by Dropbox are considered 3rd Party cookies and so they are blocked by the default cookie security rules in IE 7. These are usually blocked because of advertising servers, but there are "white hat" uses as well...such as the case with dropbox. I will add a test to the gadget to see if 3rd party cookies are enabled. Separately, there might be a way for Dropbox to change their cookies so that they will be accepted as a 3rd Party cookie. Although you can sync multiple boxes, I only sync the service with 1 PC currently, but I use the web interface frequently and a common file backup and anywhere access solution. The idea occurred to me to build a Google Gadget where I could have even easier access to my dropbox whereever I go, especially on the computers that I frequently use but do not want to install the client software. So, I created the My Dropbox Gadget. I submitted it to the Google Gadget Directory and will update the link soon. In the meantime, you can download the Dropbox Gadget here. Once I got that working, I found that the natural width of the dropbox table did not fit well with the standard module width for iGoogle, so I created a greasemonkey script that adjusts the table style so it alwasys fits the gadget with in iGoogle. you can download the Fix Dropbox Width script here.